I’m beginning to feel like I’m being set up to play the role of the little old lady who swallowed a fly. I live in a quiet suburban neighborhood outside of Syracuse, NY. It’s a peaceful neighborhood, filled with big, old trees; trees with stature and history. But it’s not a wooded area, by far. It’s neither city, nor country. Just a nice, old suburban neighborhood. And as in many suburban neighborhoods, we have the occasional sightings of small woodland creatures; squirrels, chipmunks, an infrequent rabbit…nothing too unusual. Every so often, we have the pleasure of spotting a befuddled deer standing in the middle of the road, before it gallops off to find its family. But lately, these sightings are becoming more common and increasingly bizarre. Deer seem to be everywhere these days. (One of them even charged my husband’s car the other night.) And I’ve yet to figure out the large crane-like bird I spotted standing beside the small creek which runs behind my local Target. Since our yard is fully fenced, animal sightings (aside from our own labrasaurus rex) on our property were once rare. Lately however, it’s a practical wild kingdom out there. Our perimeters have been breached. We are now the proud step-parents of a sweet brown bunny with a fluffy white tail, an orange mouse-catching tabby cat, at least one chipmunk, and a woodchuck…all of whom visit on a regular rotating basis whenever the kids or dog are not occupying the yard. Just this morning, I watched as the tabby cat (sans mouse) took his patrolling position atop the fence, much to the dismay of the woodchuck who was leisurely roaming the yard. It’s like my very own menagerie out there. Anyone know what woodchucks eat? She swallowed the deer to catch the woodchuck. She swallowed the woodchuck to catch the crane. She swallowed the crane to catch the cat. She swallowed the cat to catch the mouse. She swallowed the mouse to catch the fly… I don’t know why she swallowed the fly. Perhaps she’ll die. I don’t think I like where this is all headed. But it’s no wonder my neighborhood is being taken over by the wild. It’s been absolutely gorgeous out there. Gone are the winter coats and gone are the days of heavy macaroni and cheeses, filling casseroles, and slow-cooked roasts. This is the time for simple grilled foods and light, refreshing side dishes, like this watermelon and tomato salad. This salad just screams summer to me. 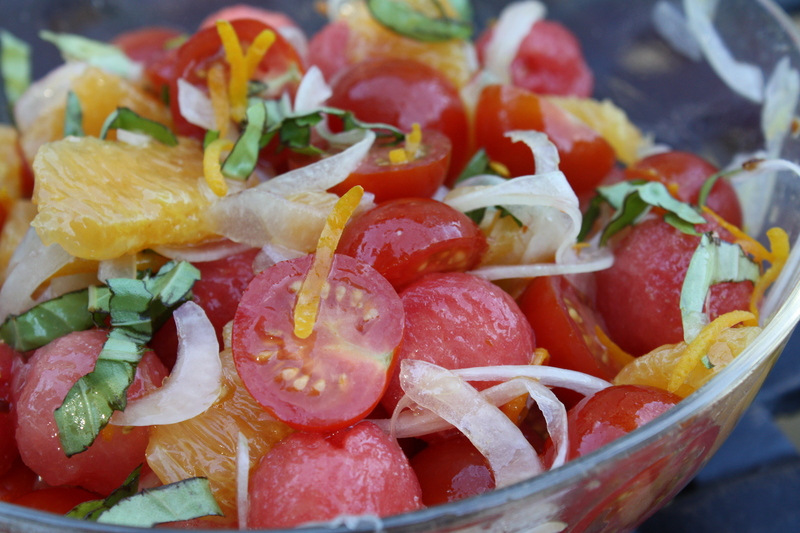 Sweet watermelon and fresh orange segments are tossed with summer-ripe tomatoes in a light orange-dijon vinaigrette. It’s beautifully vibrant in both color and flavor! 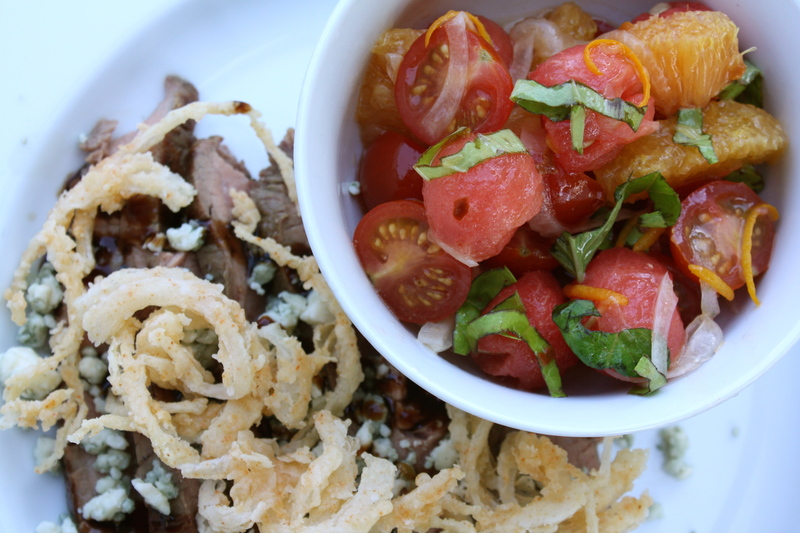 I served this summery salad as part of our Father’s Day dinner, aside slices of grilled flank steak, which I drizzled in balsamic reduction and topped with gorgonzola and homemade crispy onion straws. 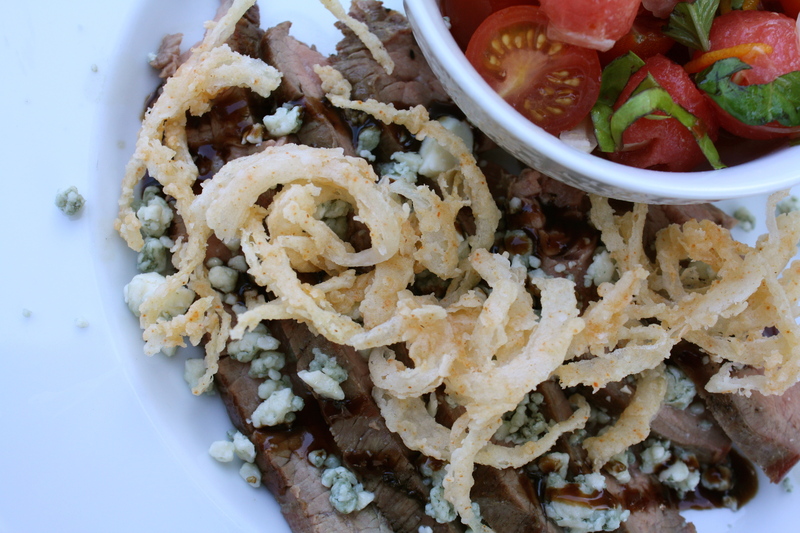 It’s a perfect meal to bring in the summer! *Click HERE to see my photo guide on how to segment an orange. **Click HERE to see my photo guide on how to chiffonade. 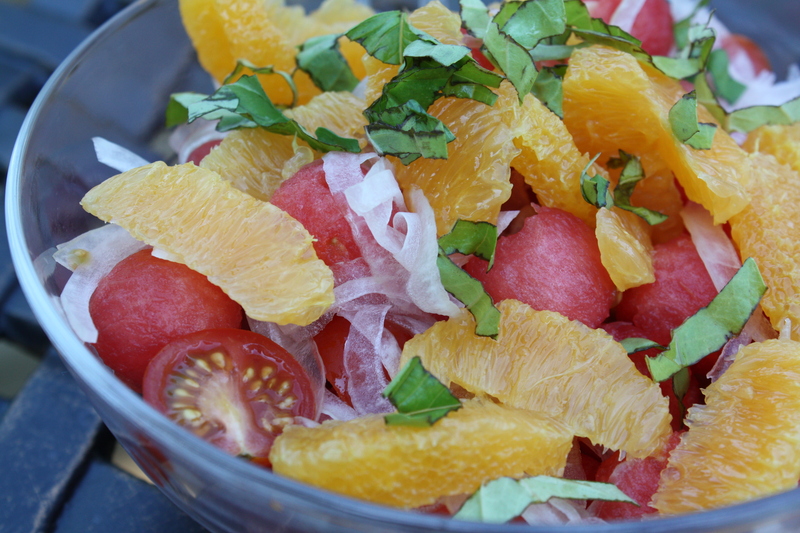 Combine the watermelon, cherry tomatoes, orange segments, red onion, and basil in a bowl. In a separate bowl, whisk together the orange juice, olive oil, red wine vinegar, mustard, and orange zest until well blended. Season with salt and crushed red pepper as desired. Pour the vinaigrette over the fruits and toss to combine. Serve chilled. Posted in Beef, Food, Fruit, Recipes, Salads, Side Dishes, Vegetable and tagged Cooking, culinary technique, Eating, family, Food, grilling, life, oranges, Recipes, salad, side dish, steak, summer, tomato, tomatoes, watermelon. Bookmark the permalink. Your bird is probably a heron – they’re long legged and billed and pretty tall. Ground hogs eat plants – like my entire row of lettuce this year!